Alleluya Bar and Cafe Where Are We? Bring along one blunt kitchen knife to practice with. Please wrap it carefully to avoid accidents in transit! Is blunt molybdenum the bane of your cookery? Help is here! This class will teach you how to tame your sharp things. Forever. We’ll start with using a steel – that slick-sounding, Samurai-looking sharpening tool, then we’ll move on to the serious business of using and caring for whet stones. We’ll also talk about which knives to use for which jobs, and give some tips on building a collection of knives to suit you. Dariush will bring along his collection of rare and vintage European, American and Japanese knives, along with the work-horse staples. 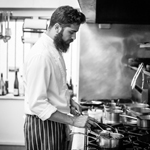 Dariush Lolaiy is the head chef and co-owner of Cazador, Auckland’s long running, wild food restaurant. Dariush hunts, butchers, cooks and serves wild fare, in the same tradition that his father, founder of Cazador, has done since 1987. Cazador recently won two Chefs Hats at the Cuisine Good Food Awards, which would have been impossible if Dariush didn’t have the right tools of the trade. 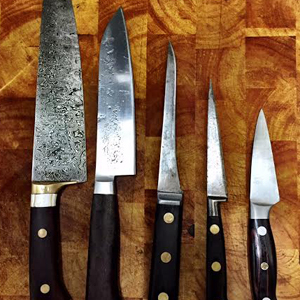 If there’s one thing a chef can’t do without, it’s sharp knives. The featured image is borrowed and edited, with thanks, from Laura Forest Photography.